This is a revised version of the foundations of critical thinking course that I developed for NYiT’s Discovery Core. 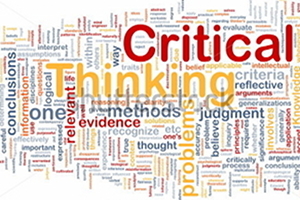 This course introduces you to the fundamentals of critical thinking both in the university and in your own life. Topics include an overview of the research methods in many academic disciplines, basic logic, and fallacies in logic and argumentation. This course serves as a foundation to prepare you to continue developing critical thinking skills in other core classes and major program coursework. This course teaches students the basic principles of logical and critical thought which are foundational to being an educated person in the 21st century. Students first investigate logic, fallacies, and strategies of argumentation. Then, students learn how to ask meaningful questions, to identify reliable sources of information in pursuit of answers to their questions, to evaluate the authority and legitimacy of the information, to use this information to formulate reasonable answers to questions and positions on issues, to assess the strengths and weaknesses and thus the validity of different answers and positions, and to make reasonable decisions on how to take appropriate personal action based upon their critical inquiry. Moreover, students apply these critical thinking strategies to real-world problem solving. As such, Foundations of Inquiry initiates students’ intellectual journey toward effective critical and innovative thinking, which are central components to NYiT’s core curriculum and major program coursework. This course prepares students to succeed in their other core and major courses, to become educated citizens, and to be well-rounded people who can apply their NYiT education to any career of their choosing. 1. Describe the major components and learning outcomes of the NYIT Discovery Core. 2. Design a basic interdisciplinary report that demonstrates 1) an understanding of research methods of selected academic disciplines and 2) contrasts journalism and formal academic research. 3. Analyze images, basic statistics, and other forms of data in the context of arguments. 5. Write organized responses, supported by evidence, to questions posed by instructor. © 2019 David S. Hogsette, PhD. All Rights Reserved.